Have you ever known someone who seemed to be able to pray for something and God answered their prayer? Like, every time no matter how serious or trivial the request may be they seem to have a direct line to God? How do they do that? Although it may seem they are special chosen ones from above, there is method to the madness. You and I can experience effective prayer just like those we hold in awe. This is exactly what Cheri addresses in this series, How Do I Do That? Today we look strategies the Bible provides for answering this question specifically, How Do I Pray? This episode is part of a new series, How Do I Do That? that hopes to meet you in the most basic Christian disciplines. You can now find How Do I Pray, and other episodes of the She Yearns Podcast from iTunes, GooglePlay, Stitcher, or SoundCloud. Just click on the links below! As always, you can scroll down and listen right here! Most of the time you and I are content to remain in the trenches. Living life, wiping noses, checking our social media status, and keeping up with the Jones. But that’s not what God intended for your Mom Life. This episode lifts our eyes to who and what God intends us to be in all it’s beauty to pursue the lofty. This episode of the She Yearns Podcast is the newest installment in the new series, More Than a Blur–Making Motherhood Matter. You and I are to do more than the average getting along and scooting by. Pursuing the Lofty Mom Life takes us through exactly how Scripture outlines this reality and how to make it our reality. This series continues to be real, raw, and absolutely hope-filled. You can now check out this current episode, Pursuing the Lofty Mom Life, as well as the rest of those in this More than a Blur series, and others from iTunes, GooglePlay, Stitcher, or SoundCloud. Just click on the links below! As always, you can scroll down and listen right here! This episode of the She Yearns Podcast is the newest installment in the new series, More Than a Blur–Making Motherhood Matter. What can we do, as moms, that makes the most impact on our present and for our futures? In this episode, While They Were Sleeping, Cheri proposes it is what happens while they (the children) are fast asleep and you and I can choose to do something else. What does this mean and how can it impact your life? That is what awaits you. Take a listen. In this installment of the series, More than a Blur, Cheri brings this question to the forefront and meets it head-on. This series continues to be real, raw, and absolutely hope-filled. You can now check out While They Were Sleeping from iTunes, GooglePlay, Stitcher, or SoundCloud. Just click on the links below! As always, you can scroll down and listen right here! Show-stopping gorgeous will never be reality for my ugly bushes simply by hoping they will someday bear beautiful roses. It’s going to require time, energy, and nothing short of Divine intervention. Why would we think flourishing spiritually would be any different? We know from John 15:8 God’s desire is for us to bear fruit. But just how does fruit-bearing work? 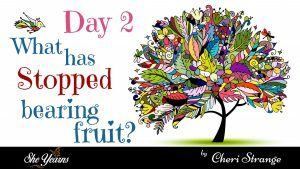 How do we become more fruitful? In the same passage in which we find His purpose, we find His plan. 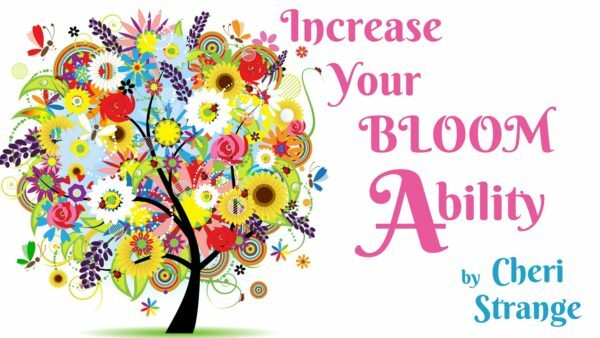 Through these verses we can discover just how to increase our bloom ability. Hold on a minute! Before Jesus jumps into our personal fruitfulness, He needs us to understand something about Himself. He introduces Himself as the True Vine. That title is significant because the vine is depicted in the Old Testament as the image of God’s chosen people, Israel. But the vine of Israel failed (Isaiah 5:1) and became and an empty vine (Hos. 10:1). Jesus takes this familiar symbol of intimacy with God, Vinedresser, to introduce Himself as better than chosen Israel because He is the Son. He can be trusted to do what needs to be done to help increase the overall fruitfulness of the vine. That is the same message He communicates to us today. He is the One who is True. He is out only for our good. And even though you and I might reflect nothing more than a scraggly bunch of sticks with thorns and a few leaves today, He sees what we can become. He can be trusted. This is the great assurance we can have! How do we Increase our Bloom Ability? We must allow God to cut away what has stopped bearing fruit. Jesus doesn’t pull any punches here. He gets right down to business. Think about what kinds of areas of life He might be meaning. What could need cutting away? Could you possibly have habits that are not God-honoring, relationships that are harmful, or ministries that are no longer bearing fruit? Could it be a job that you need to leave? Could the need for cutting relate to how you spend your money, or how you spend your time? This calls for sensitivity to the Lord’s voice, coupled with an understanding that pruning is not punishment. 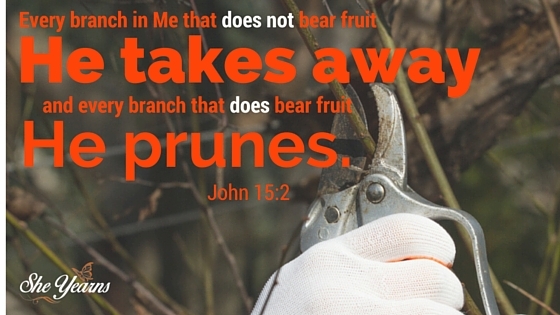 Pruning is for the overall good of the vine. You are so worth the trouble that He is stopping the universe to prune these particular branches in your life! The reality for most of us is that we need serious pruning. We misuse our time and resources. We squander that which has been entrusted to us. And, if we are honest, there are a lot of things we care about that don’t matter. What is hanging lifeless on your vine? What is not bearing fruit in your life that needs to go? What is no longer bearing fruit? May we seek first His kingdom and allow Him access to cut anything and everything away that keeps us from increasing our bloom ability.